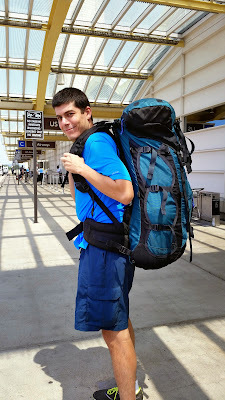 Yes, that's me in a gigantic backpack standing at National Airport. And yes, there's a story to go with it. Shira and I are off to go camping. But rather than jump in the car and drive, we're taking an airplane to our final destination. At this destination we're picking up one more camper, and then we'll be heading off to a campground. The question then becomes: how do you transport a weekend's worth of car camping gear from DC to Georgia in a sane manner? First, we laid out all the goodies we'd need; tent, sleeping bags, food, etc. I then took a look at it all, and realized there was no way I was cramming all this gear into my usual lightweight backpacking bag. Even if I could cram it all in, I'm not sure it would survive the plane trip. And I then I remembered my Lowe Contour IV. This bag is epic. I took it to Philmont (twice?) and on countless camping trips in Scouts. It's huge and built like a tank. So I dragged it out and started filling it. The thing just swallows up gear like it's nothing. In said pack is a 4 man tent, 3 sleeping bags, 3 Neorest air mattresses, cooking gear, bug spray, suntan lotion and other around the campsite neccessities, and an inflatable 2 "person" (read: kid) boat. Yes, the pack contains an actual boat. All loaded up, it's only about 40 lbs, which surprises me. 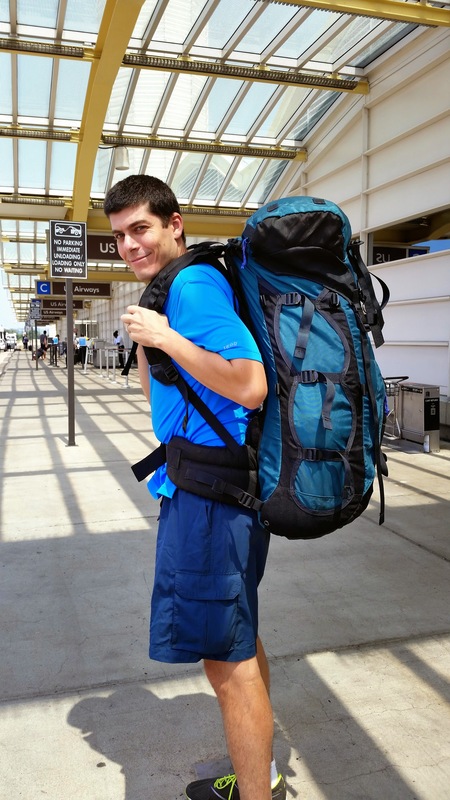 Back in the day, I got the packer over 50lbs to do Philmont. How I did this is beyond me, and I simply look back and cringe. What the heck was I thinking? But the Lowe Contour IV is truly a bag of beauty. It's got so many cool features, part of me wishes I could use it as a regular backpacking option. But the heavyweight fabric, countless straps, massive hip belt and such all come at a cost. The bag probably weighs as much as my typical base weight for an overnighter. And it's so massive, I'd never fill it with backpacking gear. Still, it felt good to heft it on. Brings back those Scouting days memories.